Here is the Misfit Psycles Dissent 29″er frame and fork that we have to build up for our review. We decided on the 19 inch size, so our numbers will reflect this. Let’s take a look at what we have here. The Misfit Psycles Dissent is an aluminum affair with an unusual aluminum rigid fork. So, we have the disc only version and from the specs we can see that Misfit Psycles took a unique approach in designing for the possibility that an end user may opt for a 100mm or 80mm suspension fork. What the specs don’t say is that the top tube and the down tube is ovalized for strength and also to maximise weld area. The top tube is bent for better stand over clearance. There are also some pretty hefty gussets on top of the head tube and underneath the down tube at the head tube junction. This frame looks pretty burly up close. The head tube area of the Dissent looks well reinforced. Misfit Psycles employs the slider style drop out to achieve proper chain tension in single speed mode. (An optional drive side slider with a derailleur hangar is available separately.) The design incorporates the option to run a Rohloff internal geared hub as standard. As with the rest of the frame, these drop outs look beefy and substantial, owing to their construction in aluminum. The non-drive side drop out incoporates the disc brake mount, so no need to fret about constant caliper futzing when removing the rear wheel, or changing cog sizes. The drop outs are secured by means of two six millimeter bolts per side. The aluminum drop outs look pretty burly. The fork is aluminum stem to stern, which is unusual in the world of 29″ers. It also features thick drop outs with generous length to the slots for the axle to nest into. These drop outs also have fender eyelets, for those so inclined. The fork blades are slightly curved and join the steer tube in typical uni-crown style. The Dissent fork is also constructed from 6061 Aluminum and has an offset of 45mm. The listed axle to crown is 465mm, but ours is measuring at 475mm. (Note: Info taken from the fork page on the website.) The fork also features the typical 1 1/8th” steer tube at a 300mm uncut length. I especially liked the addition of the hose guide behind the left fork leg for the front brake. Nice touch! The Dissent fork is made from aluminum, not your usual fork material for 29″ers. The weights of the frame and fork were remarkably similar to the stated figures on the website. The frame weighed in at 2080 grams 4.58lbs, with sliders and bolts included. (Website figure was 38 grams less) The fork came in at 740 grams/ 1.63 lbs, which was slightly less from the figure on the frame page. (Website listed at 750 grams) The head tube angle is listed at 72 degrees and the seat tube angle is listed at 73 degrees. The top tube measures an effective distance of 24.13 inches on our 19″ tester. We’ll take some fresh measurements after our build to confirm these numbers. Stay tuned for our details on the build which will appear on The Bike Lab soon. We’ll be back with the final build and some more impressions soon. Thanks to our friends over at BikeRumor.com, we were sent this spy shot of a Niner carbon fork undergoing torture testing. Take a look……..
For another shot of the fork and some other info, click BikeRumor.com’s story here. The carbon fork was seen here last summer in a spy shot from the Single Speed world Championships. Then we got the low down on the fork at Interbike. We will continue to follow the development of this fork including the official unvieling at Sea Otter in mid-April. Stay tuned! Look for an “Out Of The Box” post in the next day or so and we will also be detailing out the build on The Bike Lab in our “Budget Build” series along with our thoughts on the Fu Bar, Fu2 Bar, and the Cod Cog. Stay tuned! It has been ten years now. Ten years since a small group of enthusiastic big wheeled mountain bike believers convinced Mark Slate of WTB to pursue a project to make a two inch wide, 700c based tire for their wagon wheeler dream bikes. Mr. Slate took on the project, and in 1999 the first true fat tire for mountain biking in the 700c format was born: The Wilderness Trail Bikes Nanoraptor. The WTB Nanoraptor 29, as it appears on the WTB website today. Now I am not going to get into the debate about the history of who did what. I’m not going to deal with those who would say that “such-and-such” bike is the “first” 29″er. No, what I am going to say here is what the significance of this tire is, and why we should be tipping our hats to WTB for putting this tire out there back in 1999. Previous to the Nanoraptor we did have some mountain bike worthy 700c tires to be sure. However; these tires lacked volume and width. The Continental Goliath, the Bruce Gordon “Rock and Road”, and the best of them all, the Panaracer Smoke 45mm tires. You could mountain bike on them, but they belied the true benefits of 700c based mountain biking due to the tires lack of width and volume. A rider had to be extremely smooth and pick great lines to hold the wheel of a rider on a 26″er. For most of us, the 700c mountain bikes were a curiousity that never reached full development. With the advent of front suspension for 26″ers, the 700c off roaders looked even more “off the back”. The Nanoraptor in 29″er size changed all of that. Here was a true off road tread design that had volume and width unlike any of its predecessors. It could handle higher speed impacts without pinch flatting and could hold a line with much higher cornering speeds than the previously released 700c mountain bike treads. In fact, it was the Nanoraptors volume which gave birth to the idea of Wes Williams to start calling the bikes shod with these new shoes “29ers”. This owing to the nominal overall diameter of a Nanoraptor on a 700c rim being 29 inches. Now 700c based mountain bikes took on a whole new flavor. The Nanoraptors prescence unleashed a slew of creative ideas for using bigger wheels in an offroad setting which wouldn’t have happened without it. At least not as soon as it did. But that isn’t the only reason that we shoud give some special attention to the Nanoraptor this year. The mere fact that the “Nano”, as it is known to 29″er freaks, still exists in the WTB catalog is a testament to the tires great design. This tire is still a viable tread design for 29″ers in 2009, while other early tire designs for 29″ers have fallen by the wayside. Even if the Nano wasn’t the first true 29″er tire, it still would have to be considered one of the most important, classic tires in big wheeling history based solely on its performance over a long period of time. While there doesn’t seem to be any “official” special edition, “10th Anniversary Nanoraptor” 29″er tires coming out to help us mark the occaision, I for one will be declaring 2009 as the “Year of the Nanoraptor”. Why not? I figure that without this tire, I still might be “endo-ing” on a 26″er somewhere in the woods and not having as much fun as I do today. I will only say that I wish that the Nanoraptor would be released as a 2.4″er, but other than that nit, I tip my hat to WTB. Thanks! Here are the latest tid bits that are either news or rumors that have crossed by my monitor of late. Take a look at these items from Niner, Velocity Rims, and more…. Niner Announces Dates For Unveiling Of Carbon Fork And More: Today Niner Bikes sent e-newsletters announcing the date of the unvieling of the production version of the new carbon rigid fork that we got a glimpse of at Interbike last fall. A formal unveiling is scheduled for Sea Otter in the second half of April. In other Niner news, the e-newsletter details the production version of the revamped R.I.P. 9 which will be coming soon. Some changes were made to the production frame which include a redesigned hydroformed top tube that eliminates the gusset plates that were on either side of the pre-production frame and joined the top and down tubes. Now the frame is joined at the top and down tubes for some length before both join the head tube by means of the new hydroformed shape. 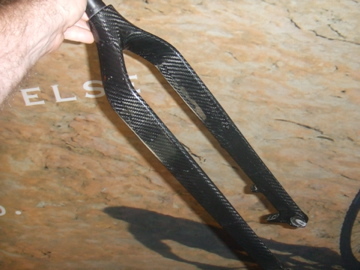 Neater welds are also reportedly to be seen on the production frames. Finally, their is a new color for the R.I.P. 9 (or should we say, “no color”!) which is “Raw”. This replaces the “Moondust Gray” that was shown earlier as one of the new colors. Niner is taking pre-orders through their dealers on these new R.I.P.9’s now. Katie Compton To Test 29″er Tubulars? : I got a tip today that Katie Compton, National Champion and World Cup winning cyclo-crosser, will be testing some tubular 29″er tires and wheels soon. The tires are said to be from Challenge, who are also working with Edge Composites on a mountain bike tubular tire tread to work with Edge Composites tubular 29″er rims. Compton is riding a Primus-Mootry bike partially made from Edge Composites manufactured tubing and rides Edge wheels in competition. Starts to all make some sense, doesn’t it? We will try to keep tabs on this as things develope. Titanium Rumors: In rumors on the magic grayish metal, a frame that has been prototyped in two different forms and was sheduled to be put into production as recently as last December has been killed. Due to constant delays, the company which had planned the 29″er hardtail has now pulled the plug on that project. However; a titanium 29″er rigid fork is still in the pipeline from this same outfit, so stay tuned, as we hope to get a sample for testing when they do become available. Editor’s note: The following is a press release from Siren Bicycles. TUCSON – (JANUARY 19, 2009) – Siren Bicycles, a boutique builder focused on the endurance mountain bike market, has partnered with World Bicycle Relief to field Team World Bicycle Relief-Siren for the upcoming season. The team will be aboard production softail Song SL bicycles, riding to raise awareness of World Bicycle Relief’s programs and mission. Collier also announced the relocation of Siren Bicycles to Tucson, Arizona. The location in central Tucson offers space for design and fabrication of both production and custom/semi-custom mountain bike frames, in addition to an upcoming “city bike” project focused on an affordable and sustainable bike design for urban use. The team consists of Pro endurance racers Dan Brennan, Todd Carpenter, Brad Majors and Chris Strout, and amateurs Craig DeAmbrose and Stephen Janes. Between them, the riders have scored several top results in recent seasons, including a podium and several top-10s in the 24-Hour National Championships; national and regional wins in 12- and 24-hour events; and strong finishes in National Ultra-Endurance (NUE) races. For 2009, the team will open the season at the 24 Hours in the Old Pueblo, near Tucson, and will go on to contest national and regional races including select NUE events and the 24 Hour National Points Series. In my post from a little over a week ago, “Monster Cross Defined, I covered the general gamut of the types of bikes that are called “Monster Cross”. This post will look at how those bikes are getting used. The controversial VooDoo Nakisi will be available soon. The Obvious: It doesn’t take a rocket scientist to figure out that Monster Cross rigs are off road rigs. The knobby tires, mud clearance, and brake choices give it away as such. However; just as there are several types of Monster Crossers, there are at least five times as many uses for them. Sometimes these uses are an intentional suggestion by the manufacturer or individual riders build out. Sometimes it isn’t so easy to tell. The Vassago Fisticuff will also be available soon. Utilitarian Rig: Many Monster Cross rigs are work horse bicycles. Covering the gamut from bar hopper to commuter rig, from touring bike to part time road rocket, and everything inbetween. For some folks, it is the perfect all-rounder. Able to cover a vast amount of their cycling needs in one package is an attractive thing as far as Monster Cross is concerned for most folks. Hard to argue with that. Versatility is the word with today’s Monster Cross rigs. This Rawland can run 650B wheels, and with the disc option can also run 29″er rubber and wheels! Versatility, Options, Fun. Probably one of Monster Crossers biggest attributes is the versatility of the bikes, making even more uses available to the cyclist. Especially the newer ones to hit the market. Not only can you run road approved wheels and tres, but some of the newer models to hit the scene can even run full on 2.1″ 29″er rubber. A jack of all trades indeed! Many are finding out that they can now own one bike and go almost anywhere, all in the same ride! “Mixed-terrain rides” are becoming increasingly popular all across the nation. Monster cross bikes seem to be tailor made for such adventures. What do you use your Monster Cross rig for? Or, if you had one, what would you use it for? Let us know in the comment section. Fight Cancer, Win A Superfly SS 29"er! Many of you out there are aware of The Fat Cyclist and how Eldon, aka “Fatty” is helping his wife Susan in her battle against cancer. Throughout all of Susan’s and Eldon’s struggles, they have shown us amazing amounts of courage, grace, and determination. Now as if that wasn’t enough, Eldon has convinced Fisher Bikes to step up and commit to an awesome raffle opportunity for all the rest of us. Question: Can You Put Road Tires On A 29"er Rim? From time to time I get questions on the site in the form of comments, or e-mails that I like to address with a post. Today’s question is about putting road tires on 29 inch rims. Can you do it? Are they compatible? What sizes are recommended? There are a lot of confusing answers floating around out there, so let’s take a look and see if we can figure this one out……….. These Easton single speed wheels are for 29″ers, but have a narrow-ish rim width suitable for road rubber. The Fit Question- Diameter: Okay, let’ get this cleared up right away. It is commonly thought that 29″er wheels are a different diameter than everything else out there. I suppose the moniker, “29”er” is to blame, but make no mistake, it is 700c. 700c, or ISO 622mm is the rim diameter for both 29″ers and road racing bikes. In fact, the ISO 622 is a very common rim diameter that is used on a wide spectrum of bicycles. The term- 29″er- refers to the total diameter of the tire and wheel together, with the rim size being ISO 622mm, or as it is commonly referred to as, 700c. Okay? That part is the simple part. A wide 700c rim, like these 35mm wide Salsa Gordo rims, are not suited for road going rubber unless it is 50mm wide or wider. The Fit Question- Rim Width: Now here is where things get a little dicey. To make it simple, you will need to match your tire width to your rim width after you determine that the diameters are compatible. So, what does that mean exactly? Let’s assume we are using only 700c/ISO 622 rims and tires to keep that part of the equation constant. A typical road tire will measure around 23mm to 28mm wide. To support the tire properly, and to allow it to function in a way that is safe, the rim the tire is mounted to must be within a certain range. Too narrow and the tire will “roll” or squirm in corners, and too wide will cause the height of the casing to be to low in relatioship to the rim walls. This will encourage tire blow offs and more pinch flat problems, not to mention a higher likelyhood of rim damage. To properly support a tire in this width range, I would recommend any rim that was 19mm wide to no more than 24mm wide. Any wider and you will start to see a drastic increase in the problems I detailed above. Some 29″er wheels have rims in this range. The Easton set, pictured above, has a 23.5mm wide rim, which should work fine with road tires in our 23mm to 28mm range. What about wider 29″er rims? Well, you would by necessity start to have to look at a wider tire. A 24mm to 28mm wide rim, which covers a lot of 29″er rims, would probably work best with tires 30 to 35mm wide, the wider rims needing the wider tires in this range. Something on the order of the Gordo (pictured above) would require a much larger tire, say at least a 2.0 inch tire and on up. I suppose some folks will say that these recommendations are too conservative, but in my mind, it is best to match proper components for the job at hand. (Of course, it could be said that running narrow tires on mountain bike rims is not matching up your components properly in the first place!) Putting a 25mm tire on a 28mm wide rim is not fitting that ideal in my mind, and I would not recommend doing that. Conclusion: So, the answer to our question is a qualified “yes” with the qualification being that your diameters, while matching for rim and tire, are not the sole determination of whether certain combinations will work. Width of the tire and rim must match within a reasonable range also, or you will be inviting trouble. First Impressions: Edge Composite 29er wheels – Increasing your carbon footprint. Since Guitar Ted, being a citizen of the great state of Iowa, is in the middle of the 2008/2009 ice age, he was kind enough to send the Edge/American Classic wheels combo out west. Here we only allow 6 days of winter and they are scheduled to not interfere with runs to the Starbucks located on every other block. Priorities, ya’ know. When I unpacked the box of wheels, they were wrapped in plastic. I picked up one of the wheels and thought, “that is a light front wheel”. It was the rear wheel. Oh…wow! I have to say that they are pretty cool looking. After years of the same shape rims either in polished or black anodized aluminum, the flat black, deep V rim is pretty stealth looking, although the Edge decals will let the world know what you are rolling on. I was not too concerned about raw weights, etc, since GT had already covered all that. I wanted to see how they compared to the wheels I am using now with tires, tubes, etc, all ready to go. I am presently running a Stan’s Flow rim on Hope hubs, standard QR, with a butted spoke of some sort (used wheels). They are tubeless with the yellow strips and separate valve stems. I had talked to GT about the possibilities of running the Edge rims tubeless. It seemed like it would need to be a ghetto conversion and I did not want to mess with that. Instead, I would run them the way the manufacturer intended. I mounted them with 26” tubes (I always use 26” tubes in any wheel that is not tubeless) and a spare set of Captain Controls/Eskars from the Specialized tire testing. I used the same QRs and the same cassette, basically stealing that stuff from the old wheels on the Lev. Disc rotors were comparable, all four being 160mm in size and pretty much the same in any other way. The difference in weight with no QRs and no Cassette was just less than 100g per wheel, with the feathery Edge rims and hubs overcoming the burlier looking Flow/Hope combo. As a side note, the American Classic hubs have a nice, smooth feel to them and the pawl action is light, but crisp, more positive than a Shimano hub, but a Swiss watch compared to the draggy Hope hubs. I did notice that the flanges, although tall, are spaced slightly narrower than the Hope hubs. Typically, as far as hub flanges go, wider is better for a stiffer wheel build. Mounting the tubes and tires was a bit like wrestling a snake, since putting a 26” tube into a 29er rim/tire combo is kind of a dance. I noticed right away that the presta valve was barely visible out of the rim, but Edge supplies little tube-like extenders that provide the needed length for airing up. They screw onto the presta valve and stay in place. Is this good or? Well, frankly it was kind of a pain in that there is some fiddling involved in getting the tube-y thingy into the hole and over the valve, threading it on without also closing the presta valve, etc. But the biggest thing in my mind is what if you lose the extender? Bummer. Are there long stem 26” tubes out there? Maybe…never needed one before…but if so, you would be about the only guy in a given group ride to be needing one, I would bet. Better carry the extenders as well as the special long stem tube. Editor’s Note: The valve extender idea will not be a foreign concept to triathletes, or roadies, but that said, it is rare in mountain biking. Cane Creek used to sell some wheels that required the valve extenders that I used in my 26″er days. In my experience, I did not find them to be any trouble, but Granny is right, if you lose one, you are stranded. The tires are a loose fit, better than the DT Swiss 7.1TK rims on the SS Monkey, but nowhere near the secure bead fit on the Stan’s Flows. Also, they are kinda’ narrow. I lost over a ¼ inch in casing width on the front Captain Control compared to the tubeless Flow combo. In fact, I still have not gotten the tires to seat evenly on the rim and both tires are dipping and diving as I look down while riding. I need to deflate and fiddle with that some more. Now, all that done, how are they on the trail? Well, that will be the task over the next bit of time. Are they all that and more? So far, one ride is not enough to know too much, but they do feel very zippy. What does zippy mean exactly? Exactly, I am not sure. But I felt like momentum was easy to initiate and maintain. Entering and exiting sharp corners and transitions was very snappy. I could not feel the wheels giving me anything but what I asked for. I did feel the tire/wheel combo deflect a couple of times over obstacles, but I bet that was the narrower rim allowing the tire to roll a bit on the rocks. That was one thing I noticed right away when I went to the wider Flow rims. The straighter sidewall a wider rim allows is nice for a bigger rider running lower tire pressures. I will run them for a while and then switch back and forth to the other wheels and see if I can tell the difference. Since I am coming from a pretty good set of wheels, I may not see the difference as much as a rider who swaps to the Edge rims from a lesser wheelset. But at the cost of this wheelbuild, I can only imagine that the target market will already be on some pretty nice rolling stock and will be considering these as an ultimate race day wheel that can feel very fast and yet take the abuse of a heavier rim. For now, I am rolling fast and happy. Will I stay that way? Time will tell. Stay tuned. You are currently browsing the The Big Wheeled Ballyhoo blog archives for January, 2009.